My family and I own some olive tree fields in the village of Fourka, Chalkidiki, Greece and we produce our own olive oil and olives. 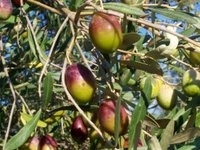 We do not sell the olive oil but instead consume it ourselves. Since it can be a lot for us, we often give it to friends and relatives. The olive oil is purely ecological as we don't use any methods or fertilizers to increase the production including watering! In order to pick the olives, I organize a mini project and invite friends and volunteers, from in or outside Greece, to participate in the olive picking and make it a more interesting and fun experience. The volunteers contribute to the olive picking get accomodation and some food. What will you learn and bring home: During this experience you will learn more about the olive oil collection and production process and olive making process. You ll also bring home your own olive oil so preferably bring some bottles to carry it back home. You will also learn more about preparation of olives (it take some steps for olives to be prepared so that they are edible), but as this requires a couple of weeks, it is more likely that you take some olives back home with you and prepare them yourself. Accomodation: Accomodation will be in our weekend house in Fourka, Chalkidiki, Greece (map) for 2-3 days. If you need to stay in Thessaloniki it is advisable to seek accomodation yourselves. Finding accomodation in the city through couchsurfing is relatively easy. How to get there: The closest airport is Thessaloniki (map). The drive from Thessaloniki to Fourka is around one hour. There are also 2 busses per day from Thessaloniki to Fourka. Depending on the number of attendees transport from Thessaloniki to Fourka will be arranged accordingly so the meeting point is Thessaloniki. What to bring: Definitely work and everyday clothes and shoes (some warm ones too as at night it can get chilli). Swimming suit might also be handy as it can also be warm. Weather: Weather is not as hot in Greece in November as it is in the summer. It can be nice and sunny but it is also likely to rain some days. The average temperature during the day is 15 -20 degrees. If it is a nice day it is also possible to swim but the sea is a bilt colder than you might expect. The village of Fourka is 3 km from the sea but it can get quite cold during the night. The weekend house is warmed with fire place and has no central heating. Interested? Get in touch with me (Rigas) somehow and I 'll answer your questions and let you know more. Even more interested? In case you would like to prolong your stay, if you liked the olive picking, you can continue to work during the olive picking season in the village, as there is a shortage of people that would do this seasonal job. After this weekend you will have become an expert and your experience will be really needed.